Schools and Kindergartens often need different requirements. Maybe a session on ‘What to do if you see a snake’ and First Aid or like most just want the children to look and touch, we are flexible and can work to meet your needs. We can bring along just a snake or extras such as Bearded dragons both juvenile and adult; Murray the turtle, a Blue Tongue and a Shingleback lizard. You are welcome to take photos throughout the session of the children interacting with the reptiles. 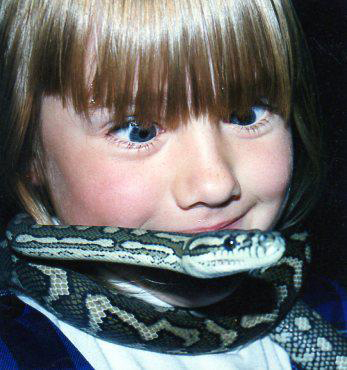 The response from the children is fantastic, especially when we bring along our 3 metre Black Headed Python. We are happy to occupy either inside or out, and have the children sit in a big circle while one of our snake catchers conduct their show. At the end the children can feel free to ask any questions they may have. Feedback from the teachers has been positive and apparently after we leave is when the children have produced some of their best work. If you’re having a party for your child and would like more information please email us with the age group, how many children attending and your location. Imagine the looks on faces of your friends or colleagues at your next special event, as they walk around smiling and relaxed with cocktail in hand – and then they meet Mr Smith – our big handsome python draped around the neck of one our guys or gals. Mr Smith is only able to attend your party if he is accompanied by one of our trained staff and can be hired out by the hour. If you would like Mr Smith at your next doo, please send us an email with your requirements. We currently have Public Liability cover to 20,000,000.